The exhibition that has broken all attendance records in recent years is coming to Naples for the first time: from 1 November 2018 to 22 April 2019, PAN | Palazzo delle Arti Di Napoli is hosting the major retrospective Escher. The show not only features works by the visionary Dutch genius, so popular with the general public, but also a wide-ranging section devoted to the influence his creations have had on the creations of later generations of artists, from album sleeves to comics, advertising and cinema. 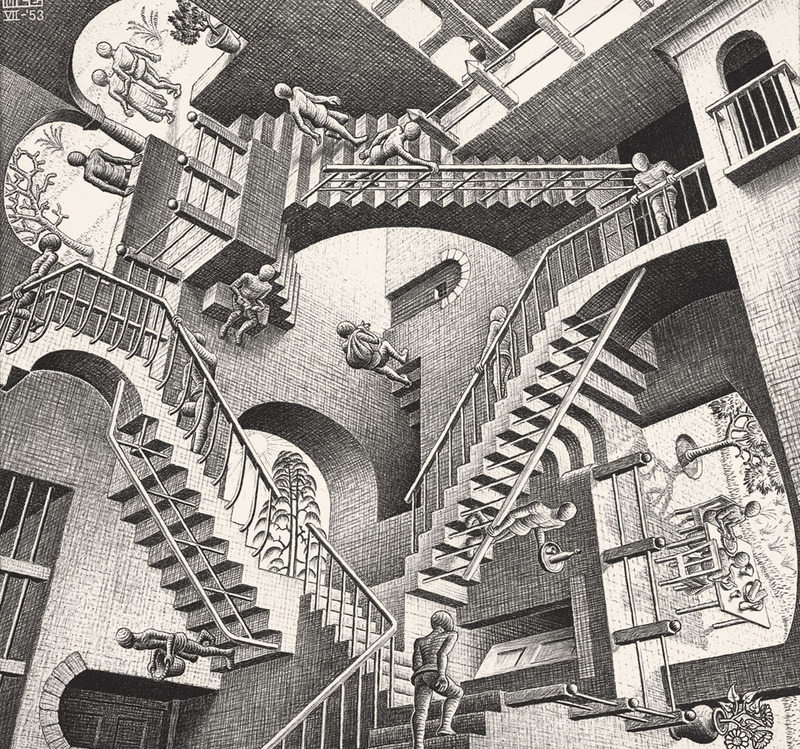 A total of around 200 works, ranging from Escher’s early period to the present. Relativity (1953), Bond of Union (1956), Metamorphosis II (1939) and Day and Night (1938) are just some of the iconic prints that made Maurits Cornelis Escher (1898–1972) famous. They are on show in the Naples exhibition, along with a selection of works – on public display for the first time – that the artist created while travelling along the Amalfi Coast to Ravello in spring 1923. This trip to Italy, which took in the whole peninsula, had a profound effect on his personal life as well as his art: in Campania he met a young Swiss woman, Jetta Umiker, whom he married the following year. In a vintage photo, taken from a high angle, the newly-weds are framed by a stunning view of Atrani and its church perched high above the sea. This church is a recurrent motif in Escher’s works, even appearing in Metamorphosis II. On this 1931 trip to Italy, where he spent various long periods, Escher visited Vietri sul Mare, Amalfi, Ravello, Scala, Positano, Praiano and Conca dei Marini. The drawings he made in the different places were developed into at least 15 prints, including Atrani, Coast of Amalfi (1931), Dilapidated Houses in Atrani (1931), San Cosimo, Ravello (1932) and The Hamlet of Turello (1932). In the South of Italy, Escher developed most of the ideas and atmospheres which, rooted in a synthesis of science and art, characterize his mature production and the studies of form that have made him unique in his genre. The audio guide supplied free to all visitors enables them to explore worlds constructed with 2- and 3-D perceptual elements, according to the mathematical and geometric laws that underpin his art. Different tools are provided in the exhibition, such as scientific experiments and educational aids, to help visitors of all ages appreciate and understand the world of a multifaceted and brilliant artist who has always enjoyed widespread popularity. The exhibition, curated by Mark Veldhuysen and Federico Giudiceandrea, is promoted by the Department of Culture and Tourism of the Naples City Council and produced and organized by Gruppo Arthemisia in collaboration with the M. C. Escher Foundation. The initiative is supported by Generali Italia through Valore Cultura, its programme that promotes art and culture throughout Italy and seeks to interest a vast and varied public – families, youth, clients and employees – in the world of art through reductions on tickets for exhibitions, theatrical performances, events and artistic and cultural activities, with the aim of creating shared value. The exhibition’s special partners are Ricola and Q8, with Trenitalia as technical sponsor, Il Mattino as media partner and RDS as radio partner. The catalogue is published by Maurits.